Dr. John Malloy, Fellowship Trained in Spine Surgery, has joined our practice. East Coast Orthopaedics provides a full spectrum of Orthopaedic services. 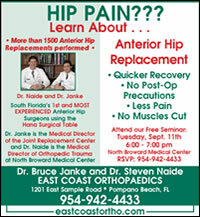 Dr. Naide and Dr. Janke are South Florida’s 1st and MOST EXPERIENCED Anterior Hip Surgeons using the Hana Surgical Table. 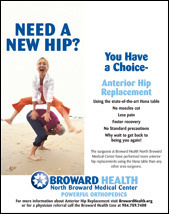 More than 1500 Anterior Hip Replacements performed. Quicker Recovery. No Post-Op Precautions. Less Pain. No Muscles Cut. Bone conserving. No muscles cut. No hip precautions. Faster recovery. Dr. Janke and Dr. Naide, expert orthopedic surgeons in anterior hip replacement surgery, are now performing anterior hip resurfacing. 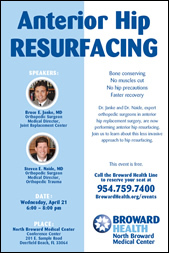 Join us to learn about this less invasive approach to hip resurfacing. 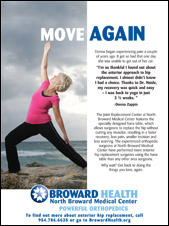 The Joint Replacement Center at North Broward Medical Center features the specially designed hana table, which allows surgeons to replace the hip without cutting any muscles, resulting in a faster recovery, less pain, smaller incision and less scarring. Using the state-of-the-art Hana table. No muscles cut. Less pain. Faster recovery. No standard precautions. Why wait to get back to being you again?